Sally Foster, Inc., is recalling about 46,800 sets of tea lights sold with votive candle holders. The tea light candles have a clear, plastic shell that can melt or ignite, posing a fire or burn hazard to consumers. Sally Foster has received two reports of the plastic shells of these tea light candles igniting, causing minor property damage. No injuries have been reported. Only the white tea light candles with clear plastic shells are affected. Products delivered after December 8, 2006 included tea lights with metal shells and are not included in this recall. The glass candle holders sold with these tea lights are not subject to the recall and consumers may continue to use them. The items were sold through Sally Foster's Web site from July 2006 through December 2006 and in Sally Foster catalogs from August 2006 through December 2006 for about $15. Consumers should immediately stop using the tea light candles and contact Sally Foster for a set of six free replacement tea light candles with metal shells. Consumers who purchased the item online will be directly notified by Sally Foster and will receive the free set of six replacement tea light candles. Consumer Contact: Call Sally Foster toll-free at (866) 723-0925 between 8 a.m. and 11 p.m. ET Monday through Friday, and between 9 a.m. and 6 p.m. Saturday through Sunday, or visit the firm's Web site at www.sallyfoster.com. SCG Liquid Propane Overfill Protection Devices are being recalled because of a safety problem. When the cylinder on the gas grill is filled to capacity and exposed to increased temperatures, liquid propane instead of gas vapor can leak out and cause the gas regulator valve to freeze. When the regulator valve thaws, if it has not been turned off, gas will flow to the grill. The resulting build-up of gas in the grill can pose a serious fire hazard to consumers. SCG has received five reports involving leaks from the OPD valve, though no injuries have been reported. The recalled SCG Overfill Prevention Devices (OPD) have "V5QA OPD" engraved on the body and handle and either "DT 3.8" or "DT 3.8A" printed on one side of the wrench pad and "07-02," "08-02," or "10-98" printed on the other side. The valves are installed on 20-pound liquid propane gas cylinders manufactured by the Sahamitr Pressure Container Public Co. Ltd. in Thailand. The cylinders are marked "SMPC DOT-4BA240" and have a serial number in the range of 375201 to 396800. There is no hazard with the cylinders. Sold at: Department and hardware stores nationwide sold the gas cylinders with the recalled OPD valves from August 2002 through August 2003 for about $30. Some cylinders also were sold with certain Sunbeam gas grills. Consumers should stop using the gas cylinders immediately and contact the company. SCG will identify, for callers who have one of the recalled units, a local LP gas exchange center which will replace the cylinder with one that has a new OPD valve. Do not take the LP gas cylinder to an LP gas refiller. Consumers should not attempt to remove the OPD or gas valve themselves. Consumer Contact: Call SCG Miyairi at (800) 636-9346 between 8 a.m. and 8 p.m. ET Monday through Friday or www.scgmiyairi.com. Next Step sippy/tumbler cups are being recall. The impact of being dropped or banged can cause the cup to break into pieces, resulting in sharp or jagged edges that pose a laceration hazard to children. Artcraft and Foremost Inc. has received 90 reports of the cups breaking into pieces and/or the handles breaking off, resulting in six reports of minor injuries such as cuts to the fingers and thumbs. The cups were distributed by Mead Johnson Nutritionals as a promotional giveaway to physicians and consumers nationwide via direct mail from September 2006 to October 2006. Consumers should take the cups away from children and discard them immediately. Consumers can contact Mead Johnson Nutritionals for information on how to receive a $10 coupon toward the purchase of Next Step LIPIL baby formula. Geometix International LLC is recalling about 40,000 sets of MagneBlocks construction toys. Tiny magnets inside the building pieces can fall out. Magnets found by young children can be swallowed or aspirated. The firm is aware of one incident where a magnet became loose. No injuries have been reported. All types of MagneBlocks construction sets are included in this recall. The sets contain six or more plastic building pieces and six or more 1/2-inch diameter steel balls. Some sets include steel rods. The building pieces are various colors and are shaped in 1 1/2-inch cubes and three-, four-, and five-sided pyramids. The plastic building pieces have "MagneBlocks" imprinted on them. The blocks were sold at discount department and toy stores and Web sites, and other toy and arts and crafts stores nationwide. The MagneBlocks magnetic building sets were sold from January 2004 through November 2006 for between $20 and $120, depending on the size of the set. Sets currently for sale have improved warning labels. Federal safety regulators recommend that children under 6 years of age not play with toys containing magnets. If a magnet comes out of one of the blocks in these sets, immediately remove the block from the set and send it to Geometrix International for a free replacement block. For additional information, contact Geometix International at (866) 775-0265 between 9 a.m. and 5 p.m. ET Monday through Friday, or visit Geometix International's Web site at www.magneblocks.com. The National Highway Traffic Safety Administration has ordered the recall of 81,000 2004 and 2005 model year Honda Accords because of a potentially unsafe driver's side airbag seat positioning sensor. The seat positioning sensor detects the driver seating position and adjusts airbag pressures. On some Honda Accord wiring harnesses the sensor was attached to the seat frame in the wrong location and may malfunction. The airbag system will default to full inflation pressure regardless of seating position increasing the risk of airbag caused injury for "smaller drivers in a frontal crash," according to NHTSA. A broken seat positioning sensor will also cause the airbag warning light to illuminate. Dealers will replace the seat position sensor wiring sub-harness when the recall begins in February. Honda Accord owners may contact NHTSA at 1-888-327-4236 or call Honda at 1-800-999-1009. 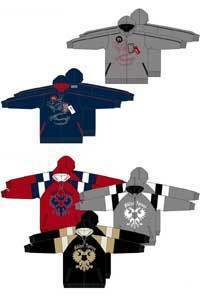 Seena International is recallinga bout 45,000 children's hooded sweatshirts with drawstrings. The garments have a drawstring through the hood, posing a strangulation hazard to children. The sweatshirts are not in compliance with federal guidelines to help prevent children from strangling or getting entangled on the neck and waist by drawstrings in upper garments, such as jackets and sweatshirts. The recall involves children's fleece hooded sweatshirts, sizes 8-12. The sweatshirts were sold in black, brown, blue, red, grey, white and off-white. The words "BKLYN Xpress" and "Brooklyn Xpress" and various graphic designs are embroidered on the sweatshirts. A sewn-in tag has one of the following style numbers: BXFL72B, BXFL73B, BXFL74B, BXFL75B, BXFL77B or BXFL80B. This recall only involves sweatshirts in sizes 8 to 12. The shirts were sold at various clothing stores, including Ross Stores & Gordman's, from September 2006 through December 2006 for about $25. Consumers should immediately remove the drawstrings from the sweatshirts to eliminate the hazard or return the garment to the store where purchased for help in removing the drawstring. Customer Contact: For additional information, contact Seena International toll-free at (866) 927-5596 between 8:30 a.m. to 4:30 p.m. ET Monday through Friday, or visit the firm's Web site at www.brooklynxpress.com. Operation of the vehicle can cause the nuts to loosen, resulting in a loss of steering control. The poses a crash hazard, which can result in injury or death. Kawasaki has received 10 reports of nuts loosening on the handlebar holder, tie-rod adjustment or tie-rod end nut. One of these incidents resulted in a consumer losing steering control during ATV operation and receiving a minor injury. The recall involves Kawasaki 2007 model year KSF50B7F (KFX50) and KSF90A7F (KFX90) All Terrain Vehicles. These are 50cc and 90cc models designed for use by operators 6 years of age and older (KFX50) and 12 years and older (KFX90). They are available in Lime Green or White, and have "Kawasaki" and "KFX50" or "KFX90" on the sides of the bodywork below the handlebars. The ATVs were sold by Kawasaki dealers nationwide from August 2006 through December 2006 for between $1,700 and $2,150. Consumers with recalled ATVs were sent direct notice from Kawasaki. Consumers should stop using these ATVs immediately and contact a local Kawasaki dealer to schedule an appointment for repair service. Consumer Contact: For more information, consumers can call Kawasaki Customer Service Department at (866) 802-9381 between 8:30 a.m. and 4:45 p.m. PT Monday through Friday, or visit the firm?s Web site at www.kawasaki.com. Pentair is recalling its MiniMax STD gas swimming pool heaters because of a carbon monoxide hazard. The pool heaters can emit excessive carbon monoxide (CO), posing a risk of CO poisoning in the event of a vent leak in an indoor installation, the company said. The heater identification number is located on the rating plate on the inner panel of the heater, which will show "NT" and "STD" in the third and fourth blocks of the number. The recall includes units with serial numbers 0606002 and lower. The recall also includes units without serial numbers. If the unit has a serial number, it is written on the data plate on the heater, which is located on the inner front door of the heater. Units with serial number 0606003 and higher are not included in this recall. MiniMax NT Low NOx and MiniMax NT TSI model pool heaters are not included in this recall. The units were sold by pool heater distributors and pool service equipment dealers nationwide from April 2002 through May 2006 for between $2,000 and $3,850 depending on the model number. Consumers should stop using these gas pool heaters installed indoors immediately, and contact the firm to determine if their heater is included in the recall. If it is, Pentair will provide a free inspection, and repair of the heater if necessary. Customer Contact: For more information, contact Pentair toll-free at (866)-761-5272 from 9 a.m. to 6 p.m. ET, Monday through Friday, or go to their Web site at www.pentairpool.com.